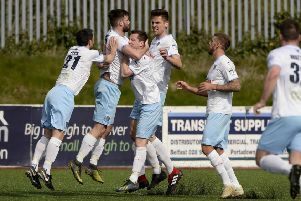 Ballymena United have signed defender Scot Whiteside on a two year deal. And Sky Blues manager David Jeffrey was delighted to get the young defender on board. “As I’ve said several times over preseason with regards to recruiting new players, we’ve changed the profile of the sort of player we’re looking for. “Younger men who had a point to prove, who want an opportunity and want to join us. “In Scot Whiteside we have got all three,” Jeffrey told the club website. “We know about his time across the water. We know about his time at Derry City and he actually had a number of options in the Irish League. “What impressed Bryan and I was that he was so knowledgeable about the league, and more so about our club and the players we had brought in. Whiteside was eager to get up and running with his new club after putting pen to paper on the contract. “Playing under David Jeffrey and the management team was a big appeal to me . “And to come and be part of building on the success the club has had since they arrived. “We’ve got to aim for Europe this year and I want to be a big part of that. “I’m looking forward to getting started in preseason and taking it from there with United,” he added.